I've been having a few requests recently about getting Rhino/Grasshopper geometry into Revit, and haven't really posted many examples of what is (and isn't) possible so thought I'd add some new examples to the blog. 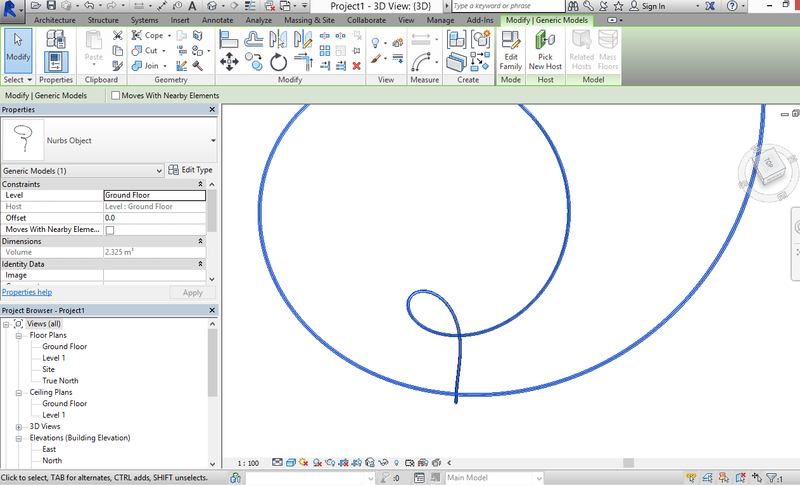 With the release of 2015, Revit has enabled some more generic solid generating functionality. At the moment it enables plane faceted objects (with straight edges) and extrusions. I've been putting forward requests for further improvements (including masking of internal edges with co-planar faces adjacent) and if more users do so, the faster we'll see this materialize. Grasshopper is a fantastic tool for projects such as sports stadia, so here's a slightly simplistic example of generating some seating tiers. You can use the IfcFacetedBrep shape representation with a categorization of an IfcSlab object (as a floor). Here's an image of the resulting Revit import. Note that it's not really possible to edit the object downstream (although I am working on improvements for updating the model). It would also be really great to be able to fix walls to the underside of the objects. To facilitate the ability to do something similar, it is possible to generate a revit extruded roof (subject to various constraints on what revit can do with this). You'll find an example of this on the inner ledge. Just note when using a stepped shape, you need to be careful that revit doesn't have thick roof types loaded in the project/template (but you need at least one). Revit has a bug that crashes if the roof is generated with a proportionally thick type. You can test with this blank project (download from here). 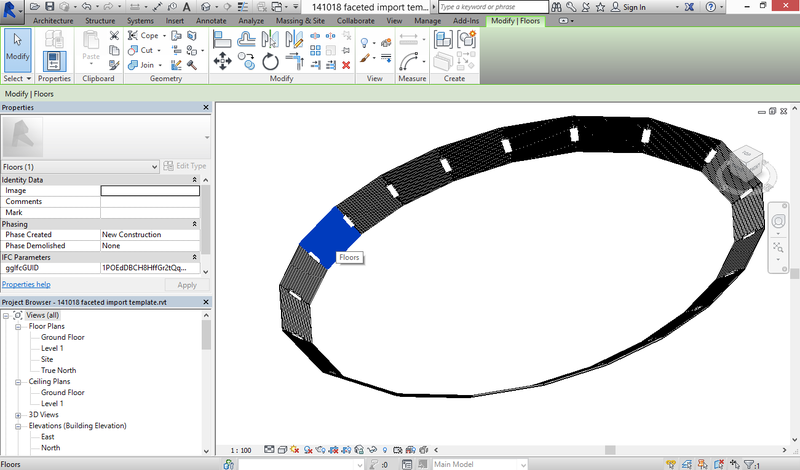 Here's the Grasshopper file (Rhino document units should be mm) and here's the resulting IFC file. So this works for faceted objects with plane faces and straight edges. If your shapes don't meet this criteria, one of the few options remaining for the time being is to import a SAT (or DWG) into a generic model family. My tools can automate this process, allowing automation of categorization and assignment of parameters/properties. Here's an example file to demonstrate this. 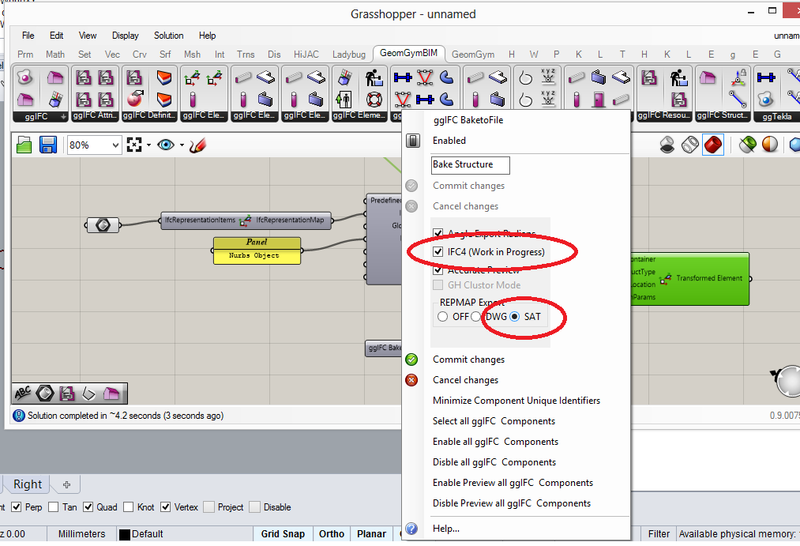 Rhino Grasshopper (Grasshopper model with new Revit Components) Note you can right click on the ggBake component and set the .SAT generation of IfcRepresentationMaps. Also make sure you're using IFC4 if nurbs are applicable. An IfcRepresentationMap is similar to a block in Rhino or a family symbol in Revit, ie a master geometry that is defined in the project/model as transformed instances. Here's the resulting IFC file. If you have suggestions for improvements, please let me know (enabling more categorization is on my todo list). The more that also contact Autodesk asking for more and more functionality to generate geometric objects the more likely we'll see earlier implementations of improvements. I'm heading back to Europe for the 2014 Rhino Meeting later this month, and as part of this brief trip will visit Paris. Mediaconstruct and RhinoForYou have arranged for a presentation of the OpenBIM workflows (including Rhino, Grasshopper, Revit, Tekla, Navisworks, Archicad and various structural analysis software etc etc) that I have been developing. If you're interested in IFC4 or Grasshopper BIM, would be great to see you there.